On one of our rambling trips through the countryside, we found ourselves in Cameron, Texas. Cameron is the county seat of Milam County and it has a lovely stone courthouse. Cameron was established in 1846 as one of the original 23 municipalities in Texas. The city is named for Captain Ewen Cameron, an adventurer and soldier from the highlands of Scotland. Captain Cameron was prominent in the Texas Revolution and was a member of the Mier Expedition. Cameron has a lot of agriculturally based businesses including milk product companies. 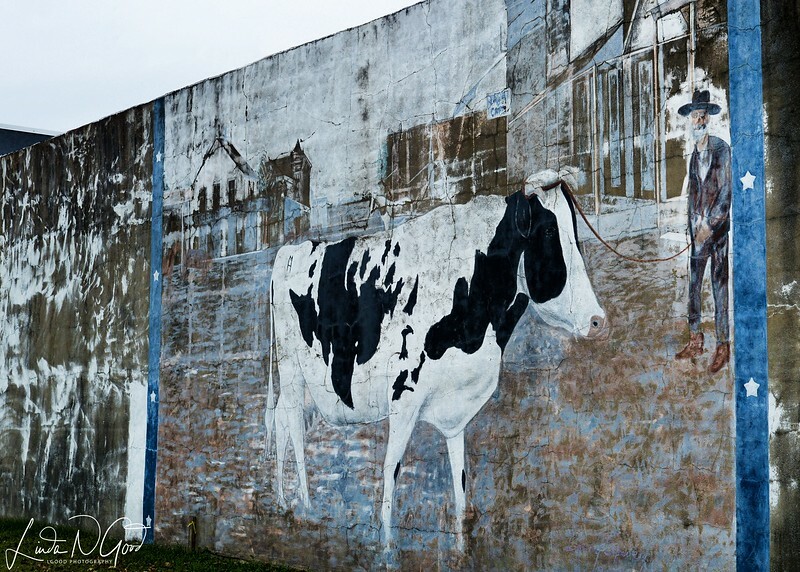 When we stumbled across this historical mural, I thought it was quite nice, and the prominent feature was this Holstein cow which is the breed that is often the majority of the cattle in milk production businesses. They give more milk than any other dairy breed in the USA. What I also found fun about the cow is that the markings on the center are roughly reminiscent of the shape of the state of Texas. Go exploring today if you can. Have a super one! Beautiful mural , so life like !! Excellent find ! Awesome find Linda, great shot of this interesting mural! Looks like a mural that has seen better days. But a great find and super shot nonetheless. Terrific find! Yes, those markings really do remind one of Texas! Wonderful find. I like the signs of age, and love the Texas-shaped patch on the cow.